A little something to read on Thanksgiving. Maybe after this, I'll leaf through Seneca, then watch Charlie Brown or something.One of the big three stoics, with the authors being Marcus Aurelius and Seneca. Epictetus recieved no formal schooling, and was a slave for most of his life. No self-pity. Instead, independence, fearlessness, and acceptance of death and suffering. Self-rule and self-improvement. Forgiveness, acceptance, and understanding. Almost resembles some forms of Buddhism. In many ways, both are fatalistic, but this is not necessarily pessimism. Instead, there is peace.I typically find most 'self-help' books to be injurious, maybe even dangerous in their mindless positivity. If it is not too imperious, I would recommend the Stoics and their friends instead, for their mindful tranquility. Stoicism according to Epictetus, is: Don't demand that things happen as you wish, but wish that they happen as they do happen, and you will go on well.and: If you ever happen to turn your attention to externals, so as to wish to please anyone, be assured that you have ruined your scheme of life.My favorite quote, maybe because it's so personally relevant and so incisive, is, and bear with Epictetus, this one is a bit long-winded:In every affair consider what precedes and follows, and then undertake it. Otherwise you will begin with spirit; but not having thought of the consequences, when some of them appear you will shamefully desist. "I would conquer at the Olympic games." But consider what precedes and follows, and then, if it is for your advantage, engage in the affair. You must conform to rules, submit to a diet, refrain from dainties; exercise your body, whether you choose it or not, at a stated hour, in heat and cold; you must drink no cold water, nor sometimes even wine. [...:] When you have evaluated all this, if your inclination still holds, then go to war. Otherwise, take notice, you will behave like children who sometimes play like wrestlers, sometimes gladiators, sometimes blow a trumpet, and sometimes act a tragedy when they have seen and admired these shows. Thus you too will be at one time a wrestler, at another a gladiator, now a philosopher, then an orator; but with your whole soul, nothing at all. Like an ape, you mimic all you see, and one thing after another is sure to please you, but is out of favor as soon as it becomes familiar.At other times, his advice is a little harder to swallow: If, for example, you are fond of a specific ceramic cup, remind yourself that it is only ceramic cups in general of which you are fond. Then, if it breaks, you will not be disturbed. If you kiss your child, or your wife, say that you only kiss things which are human, and thus you will not be disturbed if either of them dies. The overall approach to life reminds me a lot of Eastern philosophy's non-striving which I've found to be practical and beneficial. I think Epictetus captures well the balance between a complete lack of ambition and allowing ambition and materialism to consume you. Στο Εγχειρίδιον ο Επίκτητος δίνει ρητές συμβουλές για το πώς πρέπει να ζούμε. Κάποια πράγματα τα εξουσιάζουμε και άλλα όχι και πρέπει να μάθουμε την διαφορά. Της εξουσίας μας είναι η γνώμη μας, η διάθεσή μας, η επιθυμία να απολαύσουμε, η προσπάθεια να αποφύγουμε, όσα είναι δική μας ενέργεια. Δεν είναι της εξουσίας μας το σώμα, η περιουσία, οι δόξες, τα αξιώματα, όσα δεν είναι δικής μας ενέργειας.- Μη ζητάς τα γινόμενα να γίνονται όπως θέλεις, αλλά να θέλεις τα γινόμενα όπως γίνονται και θα ευροήσεις.-Ανέχου και απέχου (να έχεις υπομονή και εγκράτεια)-Αν θέλεις να σε επαινούν, μάθε πρώτα να λες καλά λόγια, και αφού μάθεις να λες καλά λόγια, να κάνεις καλές πράξεις, και τότε θα ακούς καλά λόγια για σένα.-Κανείς δεν μπορεί να είναι ελεύθερος, αν δεν είναι κύριος του εαυτού του.-Αν αναλάβεις κάποια θέση που ξεπερνά τις δυνάμεις σου, αφενός θα ρεζιλευτείς αφετέρου θα παραλείψεις να κάνεις αυτό που μπορείς.-Όρισε στον εαυτό σου ένα χαρακτήρα και έναν τρόπο ζωής που θα τον κρατάς είτε είσαι μόνος σου είτε με άλλους. I maintain the oldest writings are the absolute best. A fantastic collection of 52 maxims (#29 seems to be missing), as timeless as they are wise. Some quotes: -----------#1. Some things are in our control and others are not. Work, therefore, to be able to say to every harsh appearance, “You are but an appearance, and not absolutely the thing you appear to be.”#5. Do not be proud of any excellence that is not yours. If a horse thinks “I am handsome”, that is acceptable. But if you the owner boasts “I have a handsome horse”, know that you are elated only on the merit of the horse. Take pride, then, only in some good of your own.#8. Do not demand that things happen as you wish. Wish them to happen as they do happen, and you will be well.#9. Sickness is an impediment to the body, but not to the will… Say this with regard to everything.#11. Never say of anything “I lost it”. Say instead “I restored it.” Has your child died? It is restored. Someone else permits you to have it, so hold it as if it is not yours, like travelers at an inn.#12. Say to yourself, “This is the price paid for peace and tranquility, and nothing is free.” #15. Always behave like you are at a banquet. Take a moderate share. Has something not come yet? Do not yearn for it; wait for it to come to you. #16. You are an actor in a drama. If you should enact a poor man, see that you act it well… or a cripple, or a ruler, or a private citizen.#18. Say “Whatever happens, it is up to me to derive advantage from it.”#26. "When the neighbor’s boy has broken a cup, you at once say “Such things happen.” When your own cup breaks, you should react likewise. Apply this to bigger things. Has another’s wife or child died? All say “That’s life.” But when our own child dies, why say “How wretched am I!” ?#27. A target is not set up for the goal of missing an aim.#30. Another cannot hurt you, unless you so please.#32. First clearly understand that every event is indifferent, and nothing to you, for it is always in your power to make right use of it, and this no one can hinder.#33. Begin by prescribing to yourself some character or demeanor that you may preserve both alone and in company. Be mostly silent, speaking only what is needful, in a few words. Avoid public and vulgar entertainment. Be assured that a throughly pure person can be contaminated by conversing with a corrupt person. It is unnecessary to make public appearances, but if you must, do not appear solicitous for anything other than yourself. Wish only that things be as they are, and that the best man wins. In society, avoid frequently mentioning your actions. #38. While walking we are careful not to step on a nail or sprain our foot, so likewise take care not to hurt the ruling faculty of the mind. If we were to guard against this in each act, we’d enter events more safely.#41. Is is a mark of the inferior intellect to spend too much time on the body, being immoderate in exercise, eating, drinking, and other animalistic functions. Such things should be done incidentally, and our main strength applied to reason.#44. These statements have no interrelation: “I am richer than you, thus your superior.” “I am more eloquent than you, thus your superior.” The true, logical connections are : “I am richer than you, thus my possessions must exceed yours.” “I am more eloquent than you, thus my style must exceed yours.” But you yourself consist of neither property nor style.#55. Does anyone drink too much? Do not say that he does ill, but that he drinks a great deal. For unless you perfectly understand his motives, how can you know if he acts ill? Thus you will not risk yielding to any appearances that you do not fully comprehend. #56. Do not make much talk among the ignorant about your principles, but show them in action. For sheep do not vomit grass to show the shepherd how much they’ve eaten, but inwardly digest food and outwardly produce wool and milk. #47. Consider how more frugal the poor are than we, how much more patient of hardship.#50. Do not regard what anyone says of you; it is no concern of yours. What other master do you await as an excuse for delaying self-reformation? You will be negligent and slothful, always adding procrastination to procrastination, purpose to purpose, empty day after empty day, and thus you will accomplish nothing, living and dying and of vulgar mind. This instant, then, think yourself an adult. Make whatever appears to be the best an inviolable law..
‎‫‏‬‬لا أحبّ أن أبدأ المراجعة بذِكر سلبيات الكِتاب،لذلك سوف أبدأ بالإيجابيات، وفي رأس هذه الإيجابيات: ترجمة (أو تعريب) الدكتور عادل مصطفى الموفقة جداً للكتاب. فقد أحسست من اللغة الرفيعة المُستخدمة أنني أقرأ لأحد الروائيين العرب العظماء من أمثال طه حسين ونجيب محفوظ!ترجمة غاية في الإتقان .. والفصاحة .. والمُتعة.ومن الإيجابيات أيضاً، هي بعض (و ضَعوا خطاً كبيراً تحت كلمة بعض) أفكار ونصائح الفيلسوف الرواقي إبكتيتوس. فقد اقتبست وأعجبت ووقفت أفكر طويلاً في عدّة حِكم كَتَبها أحسست أنها لامستني شخصياً.ولكن ..كنظرة عامّة للفكر الرواقي كما تجسّده مجمل حِكم ونصائح هذا الكتاب، رأيتُ أن الرواقية متمثلة في إبكتيتوس تدعو بشكل واضح لقتل الانسانية بدعوى إحيائها. فقد أحسست أن الدعوة لدفن أي شعور إنساني بحجّة أنه شعور "مبالغ فيه" .. مثل شعور الوالد بفقد ولده، أو شعور الحبيب بهجر حبيبه، هي دعوة لا تنتهي براحة البال كما يريد الرواقيّ، بل إلى البلادة و"التّمسحة" كما يُقال! فيتحوّل الإنسان بعد تطبيق هذه الدعوة من إنسان إلى حائط أصمّ لا يُرسل ولا يستقبل!ومن العجيب أن الدكتور عادل قد ذكر في تعقيبه وشرحه للكتاب في القسم الثاني حادثة للفيلسوف إبكتيتوس شخصياً، وهي عندما عذّبه أحدهم بلوي ساقه، فقال له إبكتيتوس ببرود منبّهاً: "سوف تكسر ساقي". فلم يكترث ذلك الشخص بتنبهه، واستمرّ بلوي ساقه حتى كسرها فعلاً. فلم يردّ الفيلسوف عليه بأكثر من أن قال: "ألم أقل لك أنك ستكسر ساقي"!وقد ذكر الدكتور عادل هذه الحادثة كمثال على صبر الفيلسوف ورباطة جأشه!وأنا أعتقد أن هذه الحادثة متسقة مع دعواته المتبلّدة التي أشرتُ إليها سابقاً، وهي ليست دليلاً على صبره، بل على وصوله لمرحلة الحائط الأصم .. الذي لا يُرسل ولا يستقبل!إن كانت هذه هي السعادة من وجهة نظر الفيلسوف الرواقي .. فما أتعسها من سعادة! Favorable commentary on Epictetus lodges this collection of sayings within a wider, deeper Stoic philosophy. In a nutshell, the cosmos operates by natural law that is beyond our control. Things in the cosmos are transitory and permanent attachment is not possible. The task for the Stoic philosopher, such as Epictetus, is to focus only on those actions that are within one's power to control and to act without attachment. This is the law of the cosmos that we know through our rationality, which becomes the guide for our actions and the source of our wisdom. Cultivation of reason and cultivation of actions that are in accord with the law of the cosmos is, therefore, the path to personal happiness. The problem with this approach is apparent in this sample of Epictetus' philosophy. First, his widely regarded practical philosophy leans heavily on social manners and making a good impression ("let not your laughter be much...nor excessive.") The self thereby adjusts to external standards, but this conformity leads to the loss of individuality. Second, and similarly, truth is secondary to keeping peace with others ("defer to opinions of superiors" and "agree with equals...to avoid quarrelsomeness".) Third, in accentuating the highest human virtue, reason, our animal emotions are not just to be controlled, but denied (We should punish our appetites;we should not suffer mentally with another; and we should accept death of a loved one as part of the order of things). Self-denial and cutting off feelings toward another or toward ourselves may be denying a deeper essence to our humanity and may not be conducive to our psychological health. Fourth, his philosophy leads to a slave mentality. Imposition on the self is accepted because it's the order of things. Resignation and acceptance not active resistance is the advice of Epictetus. Fifth, he has an uneasy relationship with things of the world. One can desire, but not desire too much. Reason puts the break on attachment. What this says about love - and holding oneself back - is one concern. But, importantly, an obvious question is why should the self not want what the self wants? Intuitively, we sense a contradiction here that makes his philosophical advice unconvincing. What is missing in Epictetus is an acceptance of a vigorous circuit of energy between the self and the world. Epictetus either holds the self back from the world or merges the self too much with it. He appropriately tells us that we have two things in our power: Our movement toward the world (desire) and our movement away from the world (aversion). This means the self is free to engage that world and to resist that world when it imposes on the self. The imposition of others on the self denies the self's freedom to pursue objects of desire and, therefore, the self's power to control its own destiny. Likewise, to impose the self on others is to deny their freedom. Reason, combined with socially imposed controls, keeps self and other in balance. Individuality is compatible with order. It's o.k. to seek objects of desire. Self-denial is counter to our desiring nature and denial of our feelings denies us of what is real inside and denies us of our humanity. The restraint on our desire comes from a recognition that it must not come at the expense of the other. There's an implicit social contract that lies at the heart of the self-other relationship. This circuit of energy between the self and the world is an active and reciprocal relationship, and it also reflects nature's law. This short and simple work of stoic philosophy is as valid as when it was first penned two thousand years ago. Epictetus started life as a Greek slave, but wound up in Rome. His Enchiridion distinguishes sharply between those things we can control and those we cannot:Some things are in our control and others not. Things in our control are opinion, pursuit, desire, aversion, and, in a word, whatever are our own actions. Things not in our control are body, property, reputation, command, and, in one word, whatever are not our own actions.This type of stoicism requires reserves of strength most people do not have, as when they discover they have pancreatic cancer, or their beloved son has died, or they are slandered and have their reputations under attack. He continues:Work, therefore, to be able to say to every harsh appearance, "You are but an appearance, and not absolutely the thing you appear to be." And then examine it by those rules which you have, and first and chiefly, by this: whether it concerns the things which are in our own control, or those which are not; and, if it concerns anything not in our control, be prepared to say that it is nothing to you.Who is heroic enough to live like this? If I were, I would be immune to most if not all of the pain that human life is heir to. چه معجزه ای بزرگتر از این که کسی از دوهزار و اندی سال پیش با من حرف بزند و نشنیده به سوال هایم جواب بدهد. آرامش رواقی همه آن چیزی است که دلخوری بین من و فلسفه، علی الخصوص فیلسوف تخس و دوست داشتنی، شوپنهاور، را به کل مرتفع کرد! Epictetus is a less popular stoic than Seneca and Marcus Aurelius, and I didn’t read his works for a long time. This book was my first introduction to his wisdom, and while Seneca may be clearer in his writing, there are certain gems that Epictetus brings to the table that even Seneca and M.Aurelius aren’t able to produce. Seneca puts great emphasis on the shortness of life, tranquility, and being above suffering. Marcus Aurelius looks at the bigger picture, and the idea that we don’t have complete control of our lives. Epictetus is more practical, sharing ideas on how to behave with the stoic philosophies in mind. He gives several ideas on how one should behave in different scenarios. Here are some quotes from the book which I particularly enjoyed: “You must know then that when your cup also is broken, you ought to think as you did when your neigh-bor’s cup was broken. Transfer this reflection to greater things also. Is another man’s child or wife dead? There is no one who would not say, this is an event incident to man. But when a man’s own child or wife is dead, forthwith he calls out, Wo to me, how wretched I am.”“Avoid banquets which are given by strangers and by ignorant persons. But if ever there is occasion to join in them, let your attention be carefully fixed, that you slip not into the manners of the vulgar (the uninstructed). For you must know, that if your companion be impure, he also who keeps company with him must become impure, though he should happen to be pure. "“Do not talk much about what has passed on the stage, except about that which may lead to your own improvement. "“It is a mark of a mean capacity to spend much time on the things which concern the body, such as much exercise, much eating, much drinking, much easing of the body, much copulation. But these things should be done as subordinate things: and let all your care be directed to the mind. ““But you are neither possession nor speech. ““The condition and characteristic of an uninstructed person is this: he never expects from himself profit (advantage) nor harm, but from externals. The condition and characteristic of a philosopher is this: he expects all advantage and all harm from himself. "“If a man praises him, he ridicules the praiser to himself”“Remember that now is the contest, now are the Olympic games, and they cannot be deferred; and that it depends on one defeat and one giving way that progress is either lost or maintained.”“A man ought to know that it is not easy for him to have an opinion (or fixed principle), if he does not daily say the same things, and hear the same things, and at the same time apply them to life.”[Lampis the shipowner being asked how he acquired his wealth, answered, With no difficulty, my great wealth; but my small wealth (my first gains), with much labor.] he teaches and urges on with more vehemence him who resists reason and law. “As the sun does not wait for prayers and incantations to be induced to rise, but immediately shines and is saluted by all: so do you also not wait for clappings of hands, and shouts and praise to be induced to do good, but be a doer of good voluntarily, and you will be beloved as much as the sun.”“Neither should a ship rely on one small anchor, nor should life rest on a single hope.”Wonderful, he said, are men, who are neither willing to live nor to die. “Crows devour the eyes of the dead, when the dead have no longer need of them. But flatterers destroy the souls of the living and blind their eyes.”“A man should choose (pursue) not every pleasure, but the pleasure which leads to goodness.”Pleasure, like a kind of bait, is thrown before (in front of) everything which is really bad, and easily allures greedy souls to the hook of perdition. Think of God more frequently than you breathe. God stands by as an inspector, you will never err (do wrong) in all your prayers and in all your acts, but you will have God dwelling with you. As it is pleasant to see the sea from the land, so it is pleasant for him who has escaped from troubles to think of them. Law intends indeed to do service to human life, but it is not able when men do not choose to accept her services; for it is only in those who are obedient to her that she displays her special virtue. Nature has given to men one tongue, but two ears, that we may hear from others twice as much as we speak. If you wish to live a life free from sorrow, think of what is going to happen as if it had already happened. It is not good for him who has been well taught to talk among the untaught, as it is not right for him who is sober to talk among those who are drunk. As much a classic work of philosophy, as it is a treatise on how to live (as a stoic), the Enchiridion is dope. Because this is essentially a list of rules that is the length of an extended essay, I'll be rereading it (probably multiple times) to digest it further. Sure, there are some principles I don't subscribe to, but there is a lot of good stuff in this to mull over. I think it's interesting that something that was written more than 1,880 years ago can still be applicable to life today, as it was back then. The more things change...My favorite bit from Enchiridion is the quote that's been floating around the internet, and the reason I read this in the first place:"How long will you wait to think yourself worthy of the highest and transgress in nothing the clear pronouncement of reason? You have received the precepts which you ought to accept, and you have accepted them. Why then do you still wait for a master, that you may delay the amendment of yourself till he comes? You are a youth no longer; you are now a full-grown man. If now you are careless and indolent and are always putting off, fixing one day after another as the limit when you mean to begin attending to yourself, then, living or dying, you will make no progress but will continue unawares in ignorance. Therefore make up your mind before it is too late to live as one who is mature and proficient, and let all that seems best to you be a law that you cannot transgress. And if you encounter anything troublesome or pleasant or glorious or inglorious, remember that the hour of struggle is come, the Olympic contest is here and you may put off no longer, and that one day one action determines whether the progress you have achieved is lost or maintained." Nothing that most people don't know. Really. I'm not trying to appear brilliant. I gave 2 stars because the ideas are expressed in a lovely, straightforward prose. The problem I have with this work is that Epictetus, it seems to this non-classicist, does not give value to responsibility of obligation. For example, I sense that if someone was unhappy in a marriage, Epictetus would tell that someone to leave the marriage instead of working it out. I also sense he did not put value in emotions of pleasure. Screw you Epictetus, my feelings matter to me.He places far too much emphasis on Providence. I have read this probably 5 times. Looking forward to discussing it in heaven with him since he will surely be there. The opening line reads like a secular mantra: "Some things are in our control and others not. Things in our control are opinion, pursuit, desire, aversion, and, in a word, whatever are our own actions. Things not in our control are body, property, reputation, command, and in one word, whatever are not our actions".Further along, what to do with this realization:"Work, therefore, to be able to say to every harsh appearance, "You are but an appearance, and not absolutely the thing you appear to be". And then examine it by those rules which you have, and first, and chiefly, buy this: whether it concerns the things which are in our own control, or those which are not: and, if it concerns anything not in our control, be prepared to say that it is nothing to you. "In short, what Epictetus is saying is: be indifferent to what you can't control. Do not allow yourself to be harmed by what you can't control, then you will be strong and resilience, because no adversity that was not your doing can possibly hurt you. 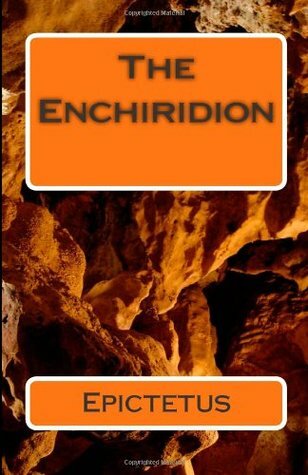 The Enchiridion is nothing short of a guide for good living. It is also an excellent translation (I have sampled other versions and they ranged from incomprehensible to boring). Excellent book, one I'll be rereading often. “Don't just say you have read books. Show that through them you have learned to think better, to be a more discriminating and reflective person. Books are the training weights of the mind. They are very helpful, but it would be a bad mistake to suppose that one has made progress simply by having internalized their contents." There isn't much here that one could take issue with. Epictetus' pithy take on morals and ethics is not that far removed from that of the New Testament. Το Ἐγχειρίδιον είναι αυτό ακριβώς που υπόσχεται ο τίτλος του: κάτι πρό-χειρο, ευσύνοπτο, να μπορεί να το κρατά στο χέρι και να το χρησιμοποιεί όποιος "θέλει να ζήσει καλά", όπως λέει κι ο Σιμπλίκιος αιώνες μετά. Μια σειρά από 53 μικρά κεφάλαια, σε αποφθεγματικό ύφος, που κινητοποιεί την ψυχή του αναγνώστη, εκτός κι αν είναι εντελώς νεκρωμένη, συνεχίζει ο αρχαίος σχολιαστής. Το βιβλίο δεν το "έγραψε" ο Επίκτητος, παρά αποτελεί συρραφή ρήσεών του που συγκέντρωσε ο μαθητής του Αρρριανός. Σκοπός του βιβλίου είναι αποτυπώσει τις κεντρικές στωικές ηθικές διδασκαλίες, χωρίς να εκθέτει παράλληλα τη φυσική και τη λογική τους -παρότι όλα μαζί αποτελούν ένα αδιάσπαστο σύνολο. Κι απώτερος σκοπός είναι να προτείνει σε αυτόν που μελετά τη (στωική, πάντα) φιλοσοφία έναν οδηγό, μια τέχνη της ζωής. Περιλαμβάνει, έτσι, τις κύριες θεματικές: την ελεύθερη βούληση του ανθρώπου και την αναγκαιότητα, τις αρετές και τις κακίες, το αγαθό, το κακό και το αδιάφορο, τις ηδονές, τις επιθυμίες και τα πάθη, τη φιλία και τον έρωτα, τους θεούς και την ειμαρμένη, τον θάνατο και την αυτοκτονία.Ο Επίκτητος απαντά στο ερώτημα πώς γίνεται κανείς φιλόσοφος, δείχνει ότι μπορεί κάποιος -ο οποιοσδήποτε- έχει δυνάμει τις ικανότητες (τη λογικότητα, πάνω απ' όλα) να προοδεύσει στη φιλοσοφία, η οποία εκλαμβάνεται κυρίως ως άσκηση.Πολλά τα αξιομνημόνευτα στο Ἐγχειρίδιον κι ο Επίκτητος διαρκώς θυμίζει ότι όλα αυτά ο "προκόπτων" στη φιλοσοφία πρέπει ακριβώς να τα θυμάται και να τα εφαρμόζει. Πολλά ίσως σήμερα μάς φαίνονται σαν εντυπωσιακά και έξυπνα τσιτάτα, όμως πρέπει να τα κατανοήσουμε ορθά, μέσα στο πλαίσιο της στωικής φιλοσοφίας. Κάποια είναι διδακτικά: "Να μην ξεχνάς ότι δεν σε προσβάλλει αυτός που σε χλευάζει ή αυτός που σε δέρνει αλλά η ιδέα που έχεις γι' αυτά, πως τάχα είναι προσβλητικά. Όταν λοιπόν σε ερεθίσει κάποιος, να ξέρεις ότι εκείνο σε ερέθισε ήταν η λαθεμένη γνώμη σου γι' αυτά τα πράγματα" (κεφ 20). Κάποια είναι πολύ σκληρά, κάποιος θάλεγε σχεδόν απάνθρωπα: "Μην πεις ποτέ για τίποτα ότι 'Αυτό το έχασα', αλλά ότι 'Το επέστρεψα᾿ Πέθανε το παιδί σου; Επιστράφηκε. Σου πήρανε το χωράφι; Ε, λοιπόν, και αυτό επιστράφηκε" (κεφ. 11).Με όλα αυτά ο Επίκτητος επαγγέλλεται μια ζωή αδέσποτη, στην ουσία της ελεύθερη, χωρίς τα πάθη και το κυνήγι τους να σε εξουσιάζουν, που θα μπορείς να ελέγχεις τις αντιλήψεις σου για τα πράγματα, με τελικό κατόρθωμα την ευδαιμονία.Η μετάφραση του Σκουτερόπουλου είναι, νομίζω, η καλύτερη από όσες κυκλοφορούν, που δεν είναι και λίγες. Το θέλει έτσι η σειρά στην οποία εντάσσεται (η εξαιρετική σειρά "Στοχασμοί" της "Στιγμής") και τα σχόλια είναι λίγα και λείπει μια επαρκής εισαγωγή στο έργο. Επίσης, το αρχαίο κείμενο από το οποίο η μετάφραση (του 1993) έχει σε κάποια σημεία διαφορές από την πιο πρόσφατη καλύτερη έκδοση (του 2007, από τον G. Boter).Με έναν λόγο: πρέπει να διαβαστεί, καθώς πρόκειται για κλασικό κείμενο της αρχαίας φιλοσοφίας και της ηθικής σκέψης -αλλά με κάποια εισαγωγική μελέτη στον στωικισμό στο άλλο χέρι. Pentru studentul care-a urmat spusele lui Epictet: la ce bun c-ai ajuns la liniştea respectivă şi, cu tact şi laşitate, te-ai ferit de toate pericolele vieţii, dacă pentru asta ai ucis orice pasiune, orice sonoritate interioară, distrugând tot ce era viu în tine, refugiindu-te, acum (chiar din tinereţea asasinată de înţelepciunea-ţi precoce), în lejera postură de cadavru cumpătat? Cartea e un scut împotriva vieţii! Un ghid eficace care te apară de stres şi de orice tulburare sufletească, oferindu-ţi, în schimb, o linişte înţeleaptă dar sterilă, pentru că n-ai făcut altceva decât să te detaşezi de toate culmile vieţii; când n-ai gustat niciodată dintr-o nevroză, când te-ai detaşat de tot ce te înconjoară, chiar şi de tine, şi-ai ajuns la o iluminare de periferie, o apatie lipsită de orice vitalitate, se mai poate numi că trăieşti? Voi reveni cu siguranţă la Epictet, mai ales la bătrâneţe (după vârsta de 50 de ani) atunci când într-adevăr, vârsta te condamnă la relaxare, la un proces de detaşare, devenind din ce în ce mai cumpătat, înţelept, şi deci lipsit de orice pasiuni. Dar să-i urmezi spusele lui Epictet la 24 de ani mi se pare atroce - refuz orice linişte sufletească, dacă pentru asta trebui să-mi vând focul lăuntric. În afară de pasajul predestinării, care ne spune că trebuie să acţionăm în viaţă conform rolului care ni s-a dat, suprimându-ne deci orice libertate de a ne făuri propriul destin, rezonez cu mai toate spusele lui Epictet, însă sufleteşte mă opun tuturor celor cu care raţional sunt de acord. Nu pot înţelege oamenii care-şi doresc liniştea cu orice preţ, chiar cu preţul cenzurării propriei vieţi, anulării, de fapt, a întregii lor vieţi. Nu va fi, oare, suficientă linişte în mormânt? Pulsati cu ardoare, şi ce dacă veţi trece prin traume, şi ce dacă veţi plânge şi veţi sângera? Fiţi vii, la sfârşitul vieţii mângâiaţi-va rănile inimii cu bucurie - ele sunt Amintirea, Amprenta, irecuzabila dovadă a faptului că AŢI TRĂIT, că n-aţi stat pe margine, aşteptând să muriţi într-o linişte reprobabilă şi sterilă, ticsită de antiviaţă. Considera todo lo óptimo como una ley inviolable. Y si se te presenta un momento de dolor o de placer, de gloria o de desgracia, recuerda que el combate es ahora. Ahora es cuando comienza la Olimpíada, y no puede ser postergada. Si te dejas vencer una vez y te entregas, tu progreso se habrá perdido; procediendo de la forma contraria, lo mantendrás. Así es como Sócrates se volvió perfecto, aprovechándolo todo para ser mejor y no escuchando otro consejo que el de la razón. Si bien todavía no eres un Sócrates, debes, sin embargo, vivir como alguien que se ha propuesto ser como él. من اجمل قراءات 2016 ..الفلسفة الرواقية مثاليةٌ بعض الشيء .. لكن تعاليمها الاخلاقية تعين الانسان كثيرا في حياته العملية اليومية اذا ما ترسخت في لاوعيه.الكتاب جد مفيد، و ترجمته من الروعة بمكان ..شكرا عادل مصطفى فانت كنز ثمين في عالم المعرفة. I was given this free review copy audiobook at my request and have voluntarily left this review.Though giving a good description of stoicism, there are some nuggets of advice that are pretty difficult to follow. This includes the comparison of a family to a pot. There are some good maxims that society nowadays would be worth living by, including #5, #8 and #30, among others, but for the most part, it would be pretty difficult to follow all of Epictetus's advice. Heavy but beautiful. I still prefer Meditations by Marcus Aurelius as far as Stoics philosophical mind fucks go but I will definitely be re-listening to this one. Also, it cracks me up how funny these grumpy sounding philosophers from a bazillion years ago can be. I mean it’s kinda dumb to assume they wouldn’t be funny, seeing as how insightful they are but it was still a delight. Happiness, the effect of virtue, is the mark which God has set up for us to aim at. Our missing it is no work of His; nor so properly anything real, as a mere negative and failure of our own. Short and pithy philosophy books are always a treat. Doesn't waste your time! Epictetus - Epictetus was a Greek Stoic philosopher. He was probably born a slave at Hierapolis, Phrygia (present day Pamukkale, Turkey), and lived in Rome until his exile to Nicopolis in northwestern Greece, where he lived most of his life and died. His teachings were noted down and published by his pupil Arrian in his Discourses. Philosophy, he taught, is a way of life and not just a theoretical discipline. To Epictetus, all external events are determined by fate, and are thus beyond our control, but we can accept whatever happens calmly and dispassionately. Individuals, however, are responsible for their own actions which they can examine and control through rigorous self-discipline. Suffering arises from trying to control what is uncontrollable, or from neglecting what is within our power. As part of the universal city that is the universe, human beings have a duty of care to all fellow humans. The person who followed these precepts would achieve happiness.